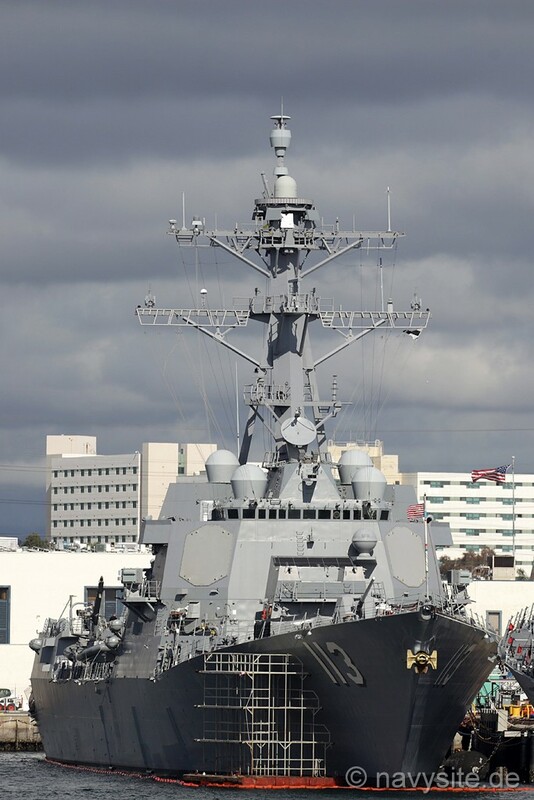 USS JOHN FINN is one of the Navy's ARLEIGH BURKE Flight IIA guided missile destroyers and the first ship in the Navy named after Lt. John Finn who was the first Medal of Honor recipient of World War II. 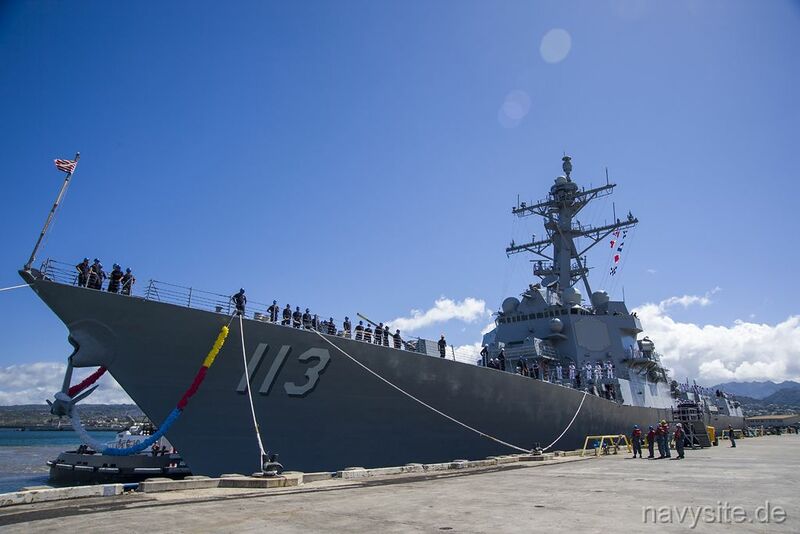 USS JOHN FINN is the first ship built with the Aegis Baseline 9 Weapon System that allows simultaneous air warfare and ballistic missile defense capability. This section contains the names of sailors who served aboard USS JOHN FINN. It is no official listing but contains the names of sailors who submitted their information. 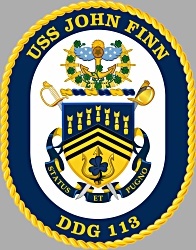 Click here to see which USS JOHN FINN memorabilia are currently for sale on ebay. Dark blue and gold are the colors of the United States Navy. The shield’s elements are counterchanged to keep them dominant. The seven aerial bombs represent the date of the attack on Pearl Harbor (December 7, 1941). The three black chevronelles allude to John Finn’s Navy Chief Petty Officer rank, and the color black recalls that he was the last living Medal of Honor recipient from the Pearl Harbor attack. The trident represents naval authority, and the three spikes stand for the ship’s multi-mission capability. The blue barbed shamrock against the yellow field represents John Finn’s naval career and his lineage as a tough American-Irishman who embodied the motto, “Status Et Pugno” (Stand Fast and Fight). The anchor, the color and stars on the winged bomb, and the superimposed star on the bomb are elements representing the Navy Medal of Honor. (As a Chief Petty Officer, John Finn received this award at the start of WWII.) The winged bomb symbolizes John Finn’s rating of chief aviation ordnance man stationed at Naval Air Station Kaneohe Bay. The 50-caliber rounds recall his manning a machine gun from an exposed position throughout the attack on 7 December 1941. 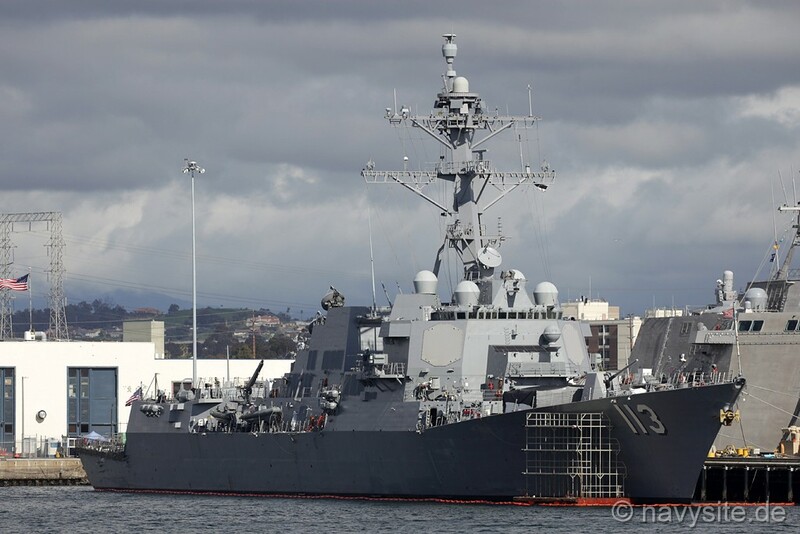 The winged bomb also represents that DDG 113 is the first ship built with the Aegis Baseline 9 Weapon System that allows simultaneous air warfare and ballistic missile defense capability. The twelve shamrocks recall CPO Finn’s Irish heritage and the numerous times he was hit by enemy fire. John William Finn was born on July 24, 1909 in Los Angeles, California. He enlisted in the navy just before his seventeenth birthday in July 1926. After briefly working with a ceremonial guard company, he attended General Aviation Utilities Training, initially working in aircraft repair and later became an Aviation Ordnanceman, working on anti-aircraft guns. By 1935, he had risen to the rank of Chief Petty Officer, just nine years after enlisting. Once Chief Finn was officially an Aviation Ordnanceman, he deployed aboard USS LEXINGTON (CV 2). Following his tour with LEXINGTON, Chief Finn moved on to be a part of the precommissioning crew with USS HOUSTON (CA 30). Chief Finn also served aboard USS JASON (AC 12), USS SARATOGA (CV 3), and the USS CINCINNATI (CL 6). He then transferred to shore duty with Patrol Squadron Fourteen/Forty-Five in Kaneohe Bay, Hawaii. Just before 8 o’clock in the morning on December 7, 1941, Chief Finn, who was in bed with his wife, Alice, heard the sound of low-flying aircraft and machine guns. On his way to the hangars, he caught sight of Japanese planes in the sky attacking the base. Chief Finn grabbed a 50-caliber machine gun and mounted it on an improvised tripod and set it up in an open area near a runway and began firing. After two and a half hours of shooting at Japanese Zeroes, Chief Finn had sustained over twenty injuries, including a bullet wound in his left arm; a broken left foot; shrapnel to his chest, stomach, right elbow and thumb; and a laceration to his scalp. Chief Finn did not leave his post until he received direct orders to go seek medical attention. He put himself back into the fight after receiving emergency treatment by rearming planes as they returned. 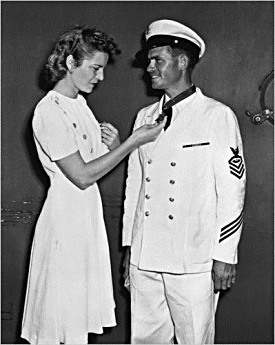 In June 1942, Chief Finn was temporarily commissioned as an Ensign, rising in rank to Lieutenant two years later serving with Bombing Squadron 102 aboard the USS HANCOCK (CV 19). Following his transfer to the Fleet Reserve in March 1947, he reverted to the enlisted rate of Chief Petty Officer. In September 1956, he was placed on the retired list as a Lieutenant. After the military, Chief Finn moved to a ranch near Pine Valley, California with his wife and son. He and his wife fostered five Native American children which led to them being honored by the Diegueno tribe. Chief Finn passed away at the age of 100 on May 27, 2010 in a veteran’s home in Chula Vista, California. He was the last surviving Medal of Honor recipient from the attack on Pearl Harbor, the oldest living recipient, and the only Aviation Ordnanceman to have ever received the medal. 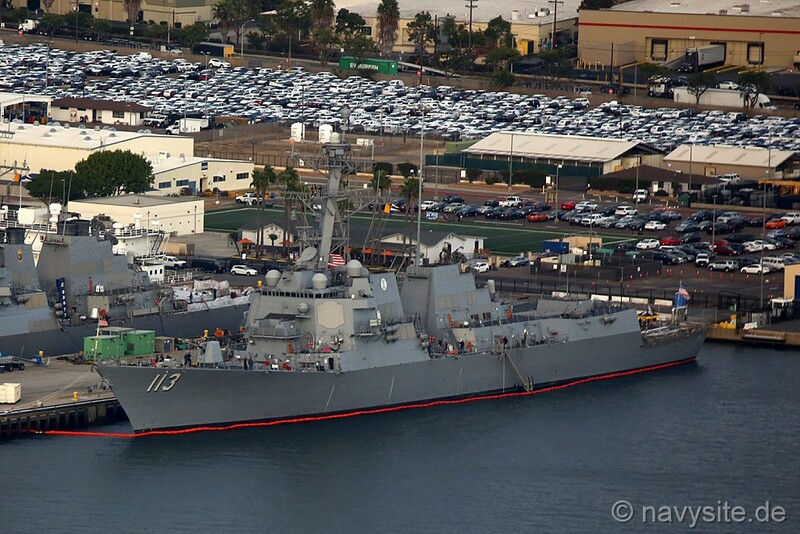 The photo below was taken by Sebastian Thoma and shows the JOHN FINN at Naval Base San Diego, Calif., on November 10, 2017. 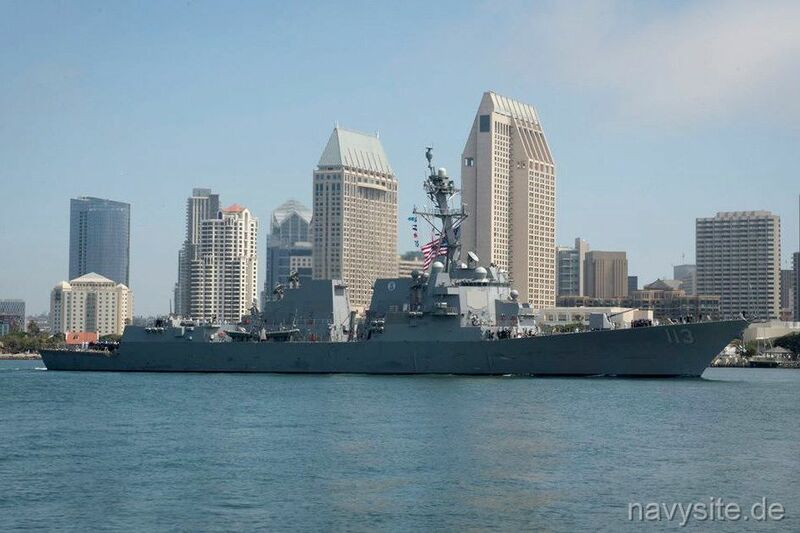 The photos below were taken by Michael Jenning and show the JOHN FINN at Naval Base San Diego, Calif., on March 2, 2019.